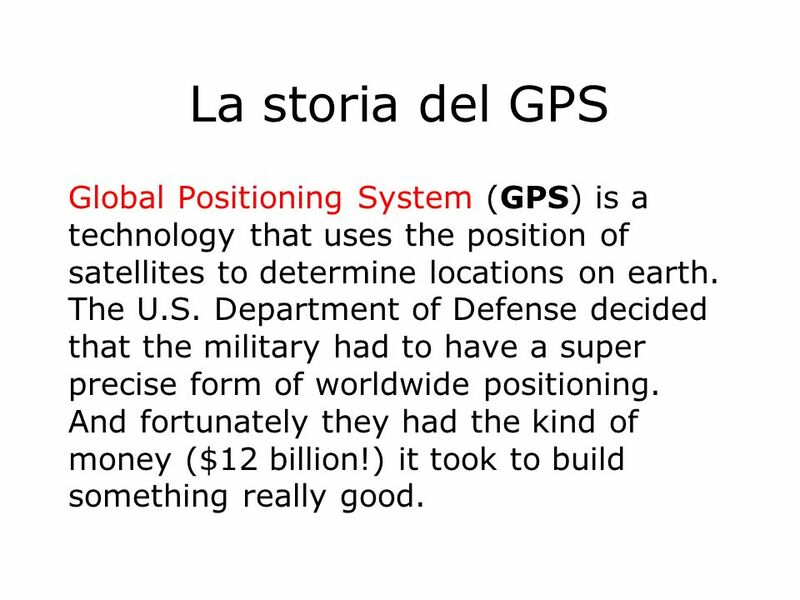 2 La storia del GPS Global Positioning System (GPS) is a technology that uses the position of satellites to determine locations on earth. The U.S. Department of Defense decided that the military had to have a super precise form of worldwide positioning. And fortunately they had the kind of money ($12 billion!) it took to build something really good. 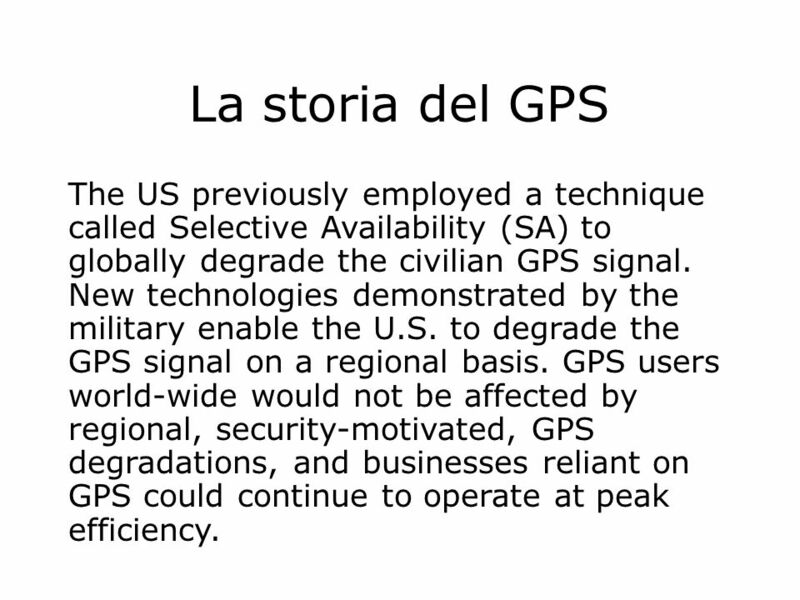 3 La storia del GPS The US previously employed a technique called Selective Availability (SA) to globally degrade the civilian GPS signal. New technologies demonstrated by the military enable the U.S. to degrade the GPS signal on a regional basis. 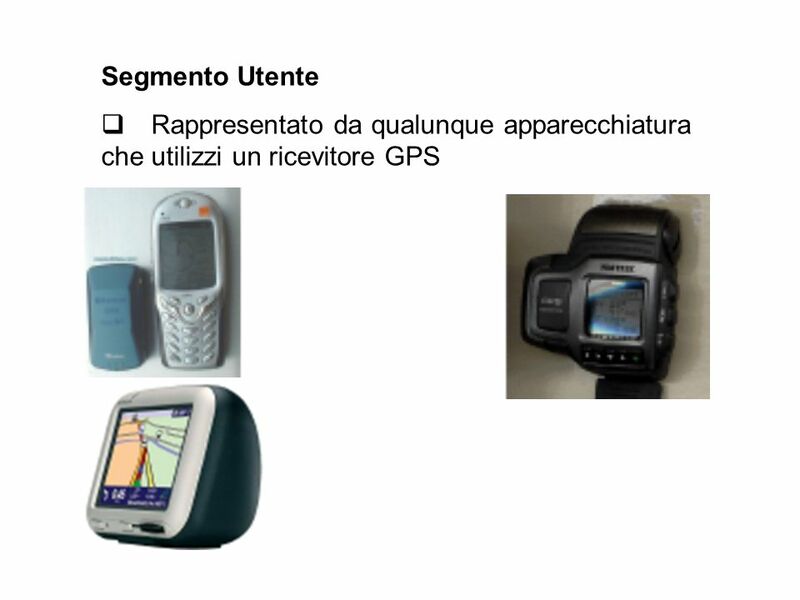 GPS users world-wide would not be affected by regional, security-motivated, GPS degradations, and businesses reliant on GPS could continue to operate at peak efficiency. 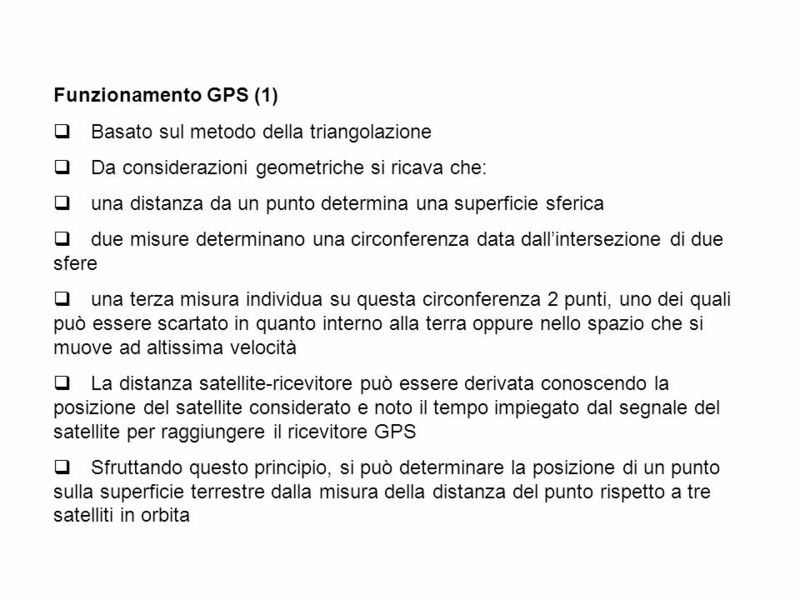 4 What’s GPS? 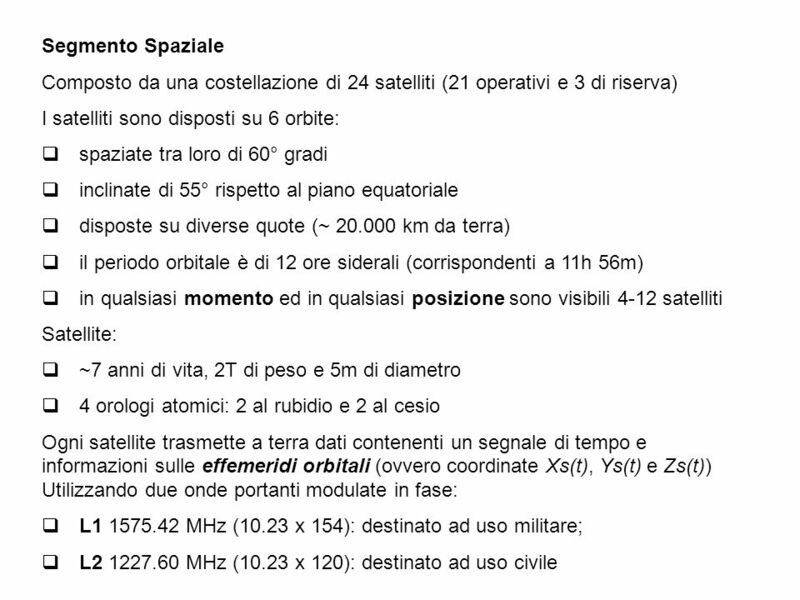 GPS is a system of 27 satellites (24 active, 3 reserve) to calculate a position. Satellites transmit their current position down to Earth via radio waves. 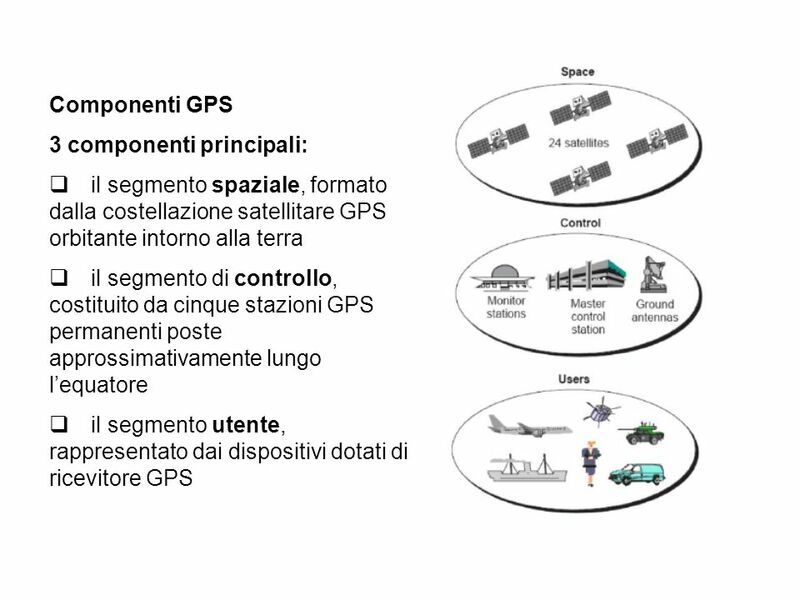 GPS devices receive signals from GPS satellites and determine latitude and longitude of current position on the Earth's surface. 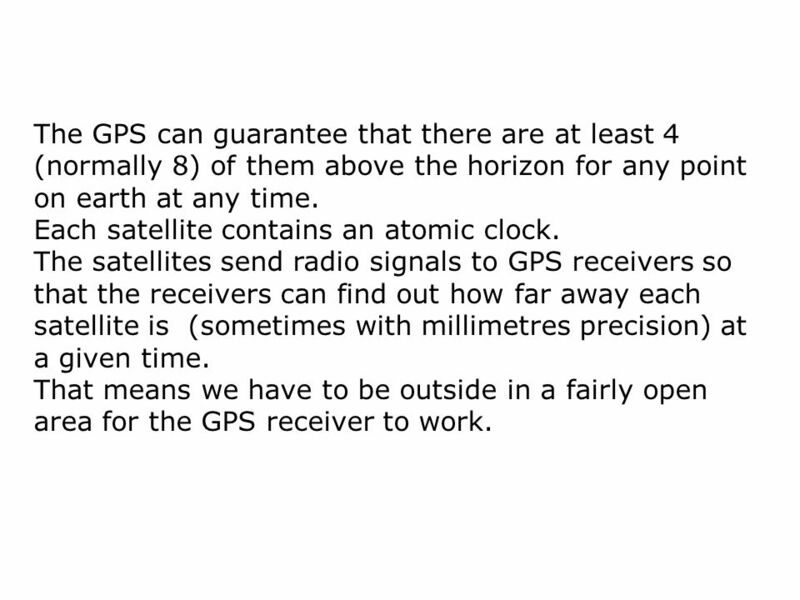 5 The GPS can guarantee that there are at least 4 (normally 8) of them above the horizon for any point on earth at any time. Each satellite contains an atomic clock. The satellites send radio signals to GPS receivers so that the receivers can find out how far away each satellite is (sometimes with millimetres precision) at a given time. That means we have to be outside in a fairly open area for the GPS receiver to work. Il segnale non viaggia nel vuoto. Attraversa: q Ionosfera (0-70 km) densa di particelle cariche elettricamente e quindi in grado di deviare le onde radio q Troposfera ( km) caratterizzata da una forte presenza di acqua Risultato: q rifrazioni e variazioni di velocità che producono allungamenti e deviazioni dei percorsi del segnale rispetto a quelli previsti rettilinei Importante notare che tali ritardi non sono costanti ma dipendono da: q elevazione del satellite: segnali dei satelliti di bassa elevazione sono maggiormente soggetti a variazioni (maggiore distanza percorsa attraverso la ionosfera). 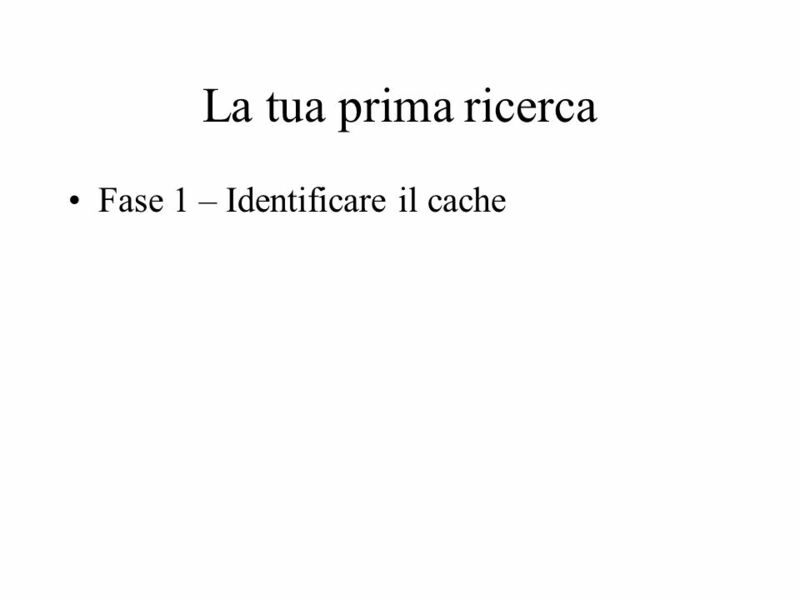 Tipicamente si impone una soglia (es. 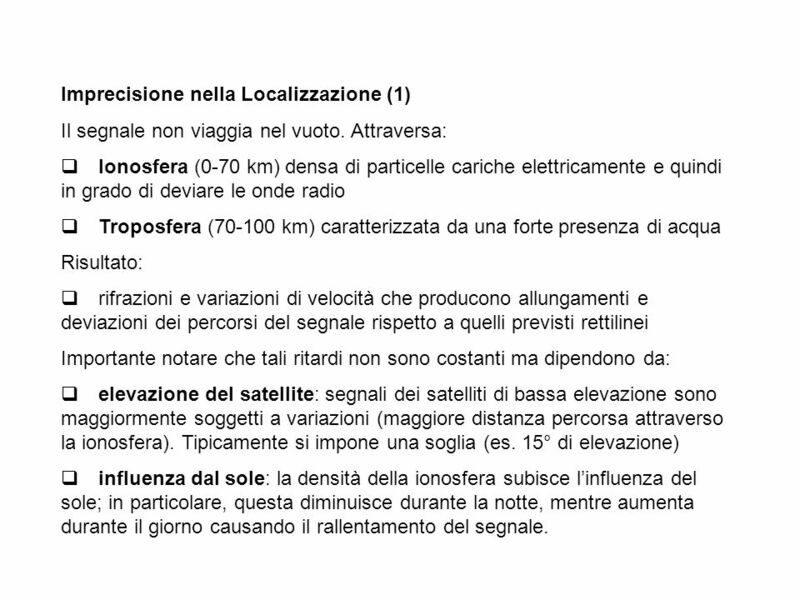 15° di elevazione) q influenza dal sole: la densità della ionosfera subisce l’influenza del sole; in particolare, questa diminuisce durante la notte, mentre aumenta durante il giorno causando il rallentamento del segnale. 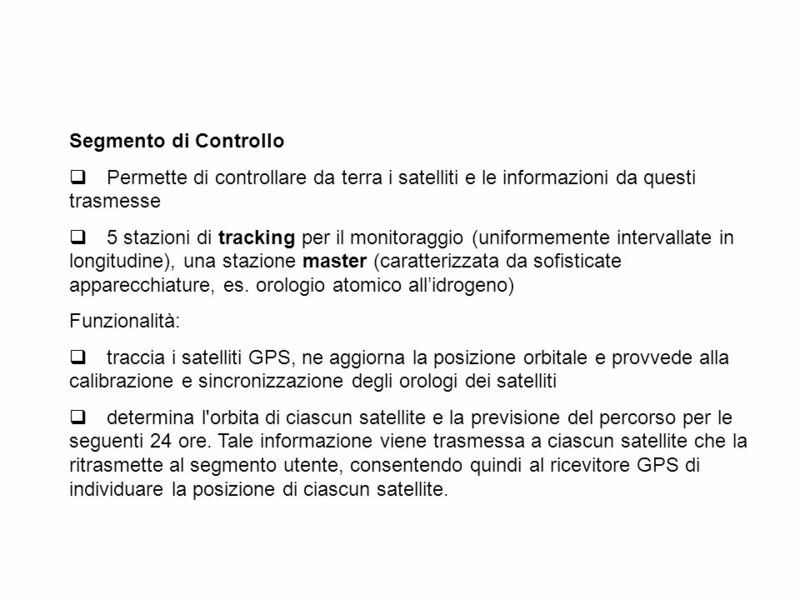 11 Segmento di Controllo q Permette di controllare da terra i satelliti e le informazioni da questi trasmesse q 5 stazioni di tracking per il monitoraggio (uniformemente intervallate in longitudine), una stazione master (caratterizzata da sofisticate apparecchiature, es. 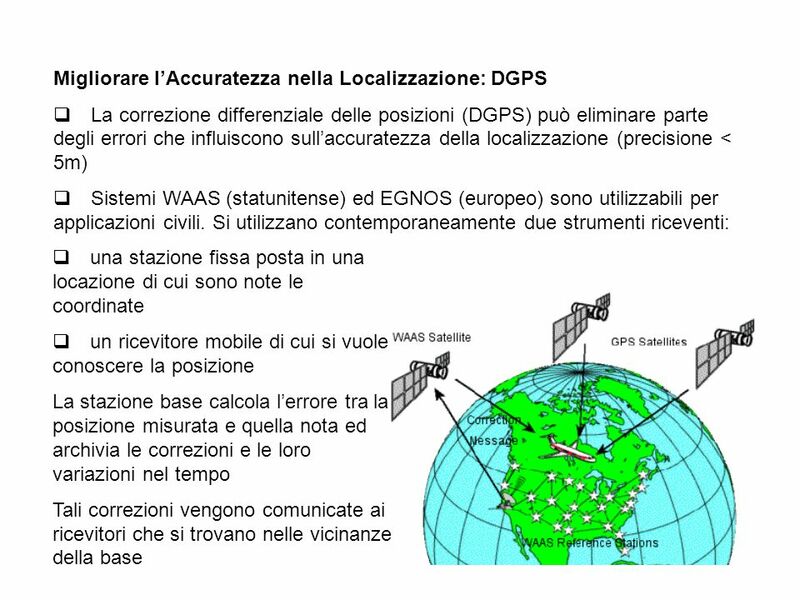 orologio atomico all’idrogeno) Funzionalità: q traccia i satelliti GPS, ne aggiorna la posizione orbitale e provvede alla calibrazione e sincronizzazione degli orologi dei satelliti q determina l'orbita di ciascun satellite e la previsione del percorso per le seguenti 24 ore. 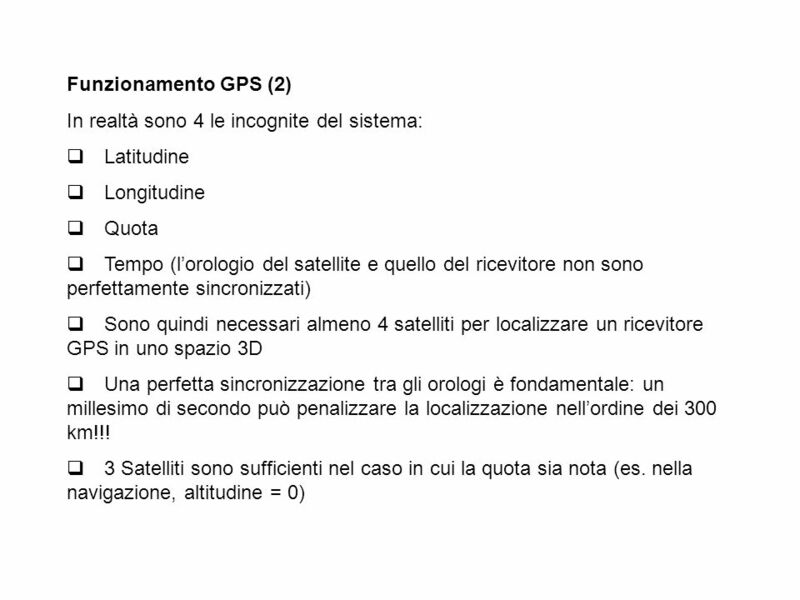 Tale informazione viene trasmessa a ciascun satellite che la ritrasmette al segmento utente, consentendo quindi al ricevitore GPS di individuare la posizione di ciascun satellite. 15 What’s Geocaching? 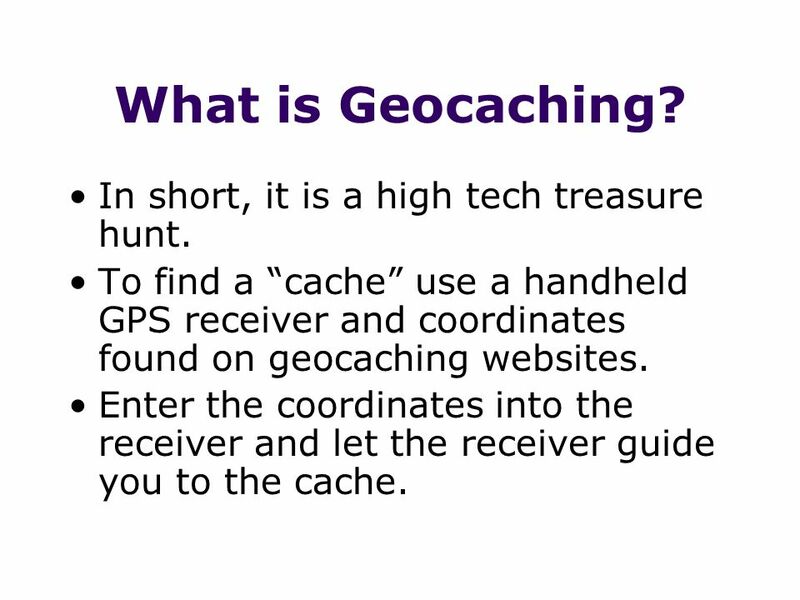 GPS users can then use the coordinates to find the caches. 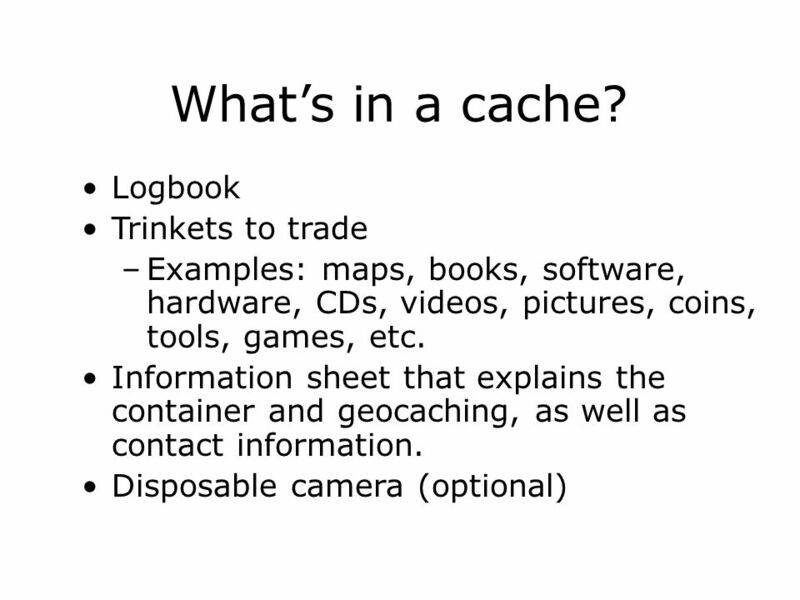 The visitor may take something from the cache, leave something, and/or sign the logbook. 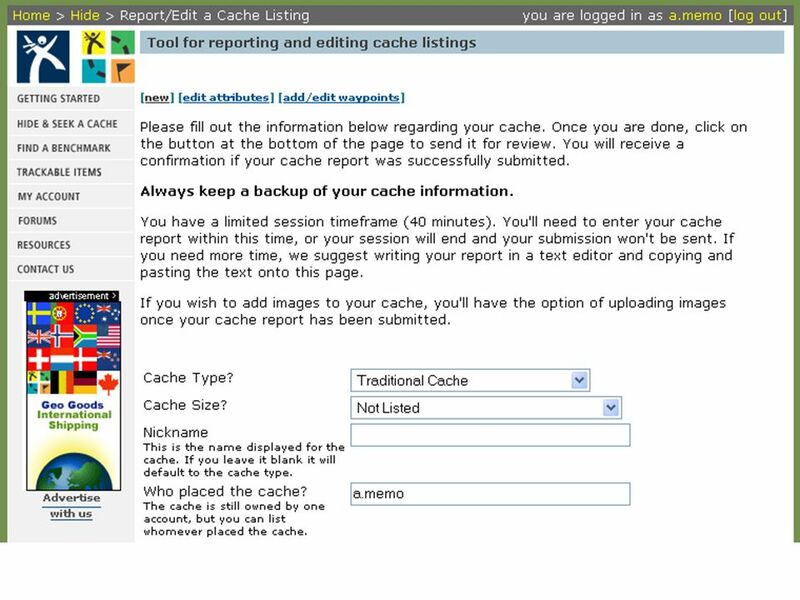 The “find” is then logged onto the Internet website where statistics about found and hidden caches are maintained. 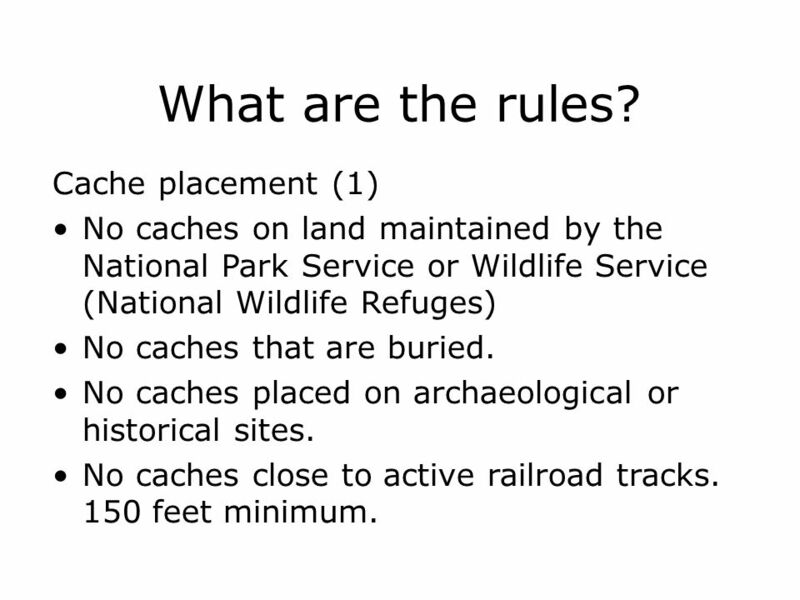 16 Geocaches are not allowed to be buried in the ground. What’s Geocaching? 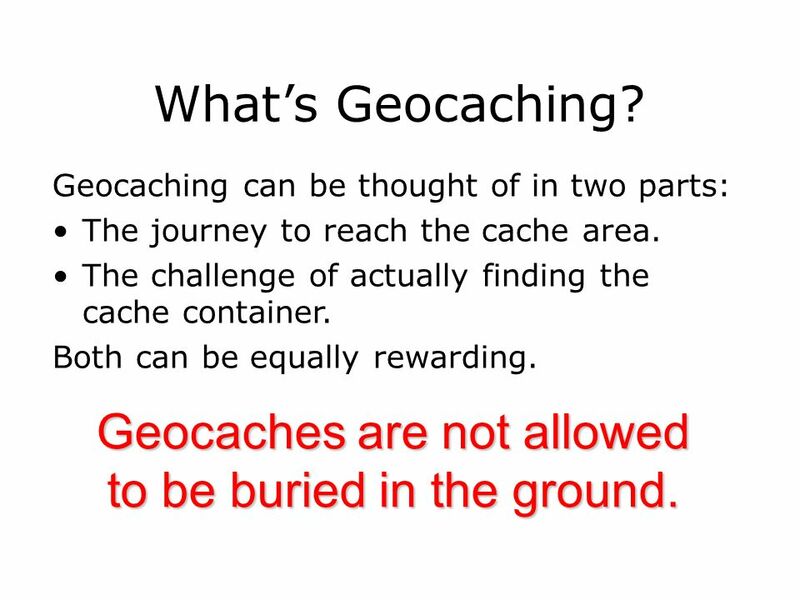 Geocaching can be thought of in two parts: The journey to reach the cache area. 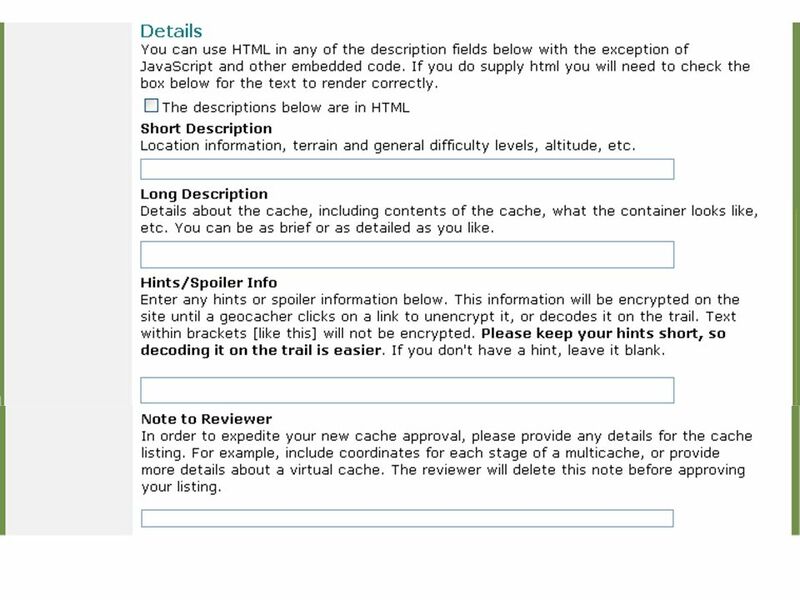 The challenge of actually finding the cache container. Both can be equally rewarding. 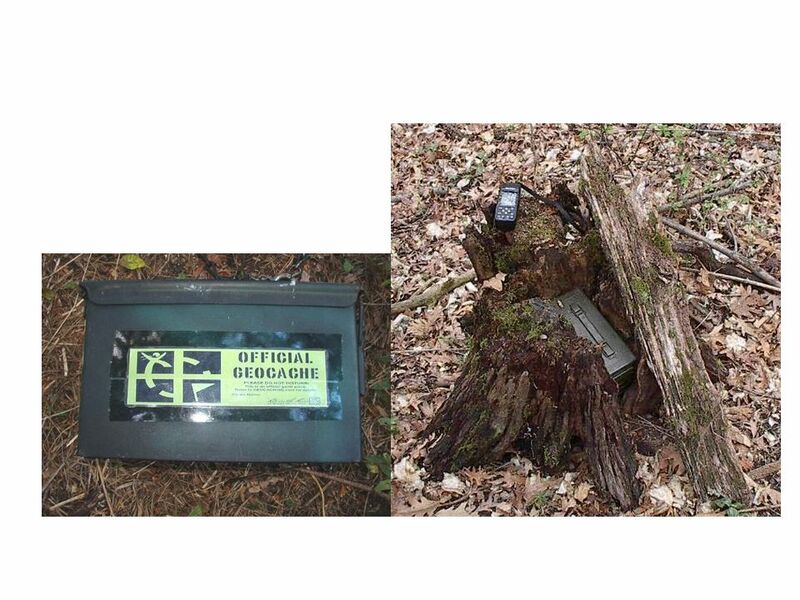 Geocaches are not allowed to be buried in the ground. 17 How did it get started? 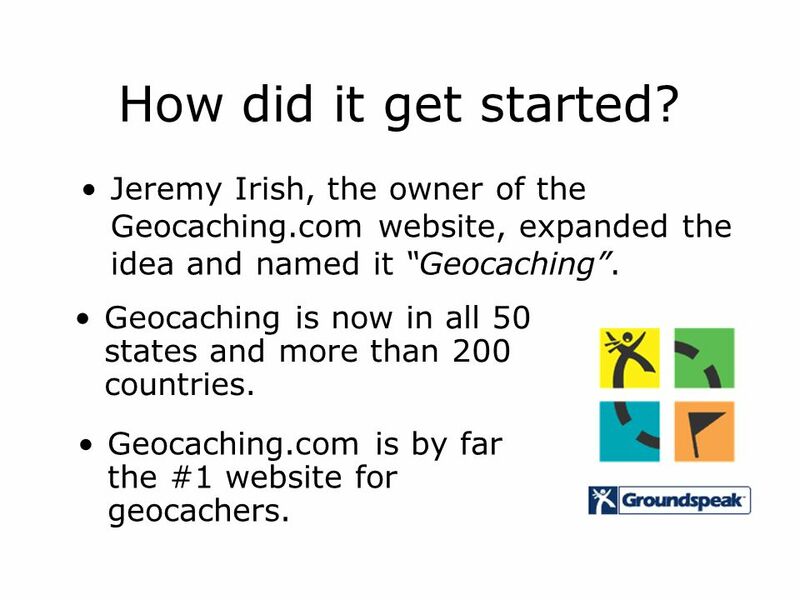 Jeremy Irish, the owner of the Geocaching.com website, expanded the idea and named it “Geocaching”. 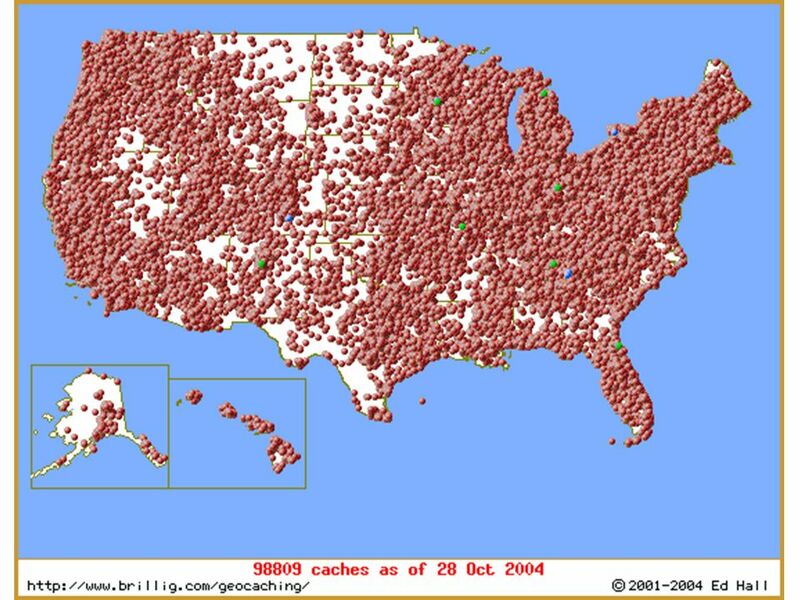 Geocaching is now in all 50 states and more than 200 countries. 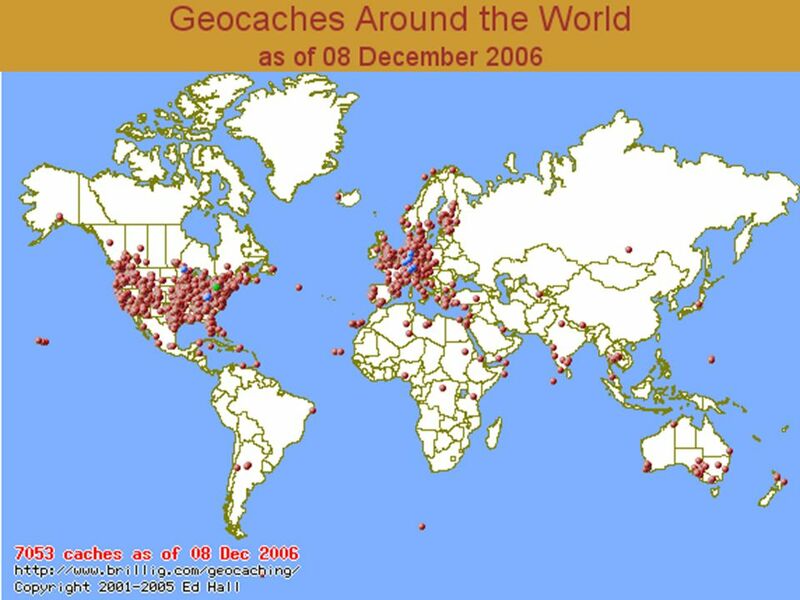 Geocaching.com is by far the #1 website for geocachers. No caches on land maintained by the National Park Service or Wildlife Service (National Wildlife Refuges) No caches that are buried. 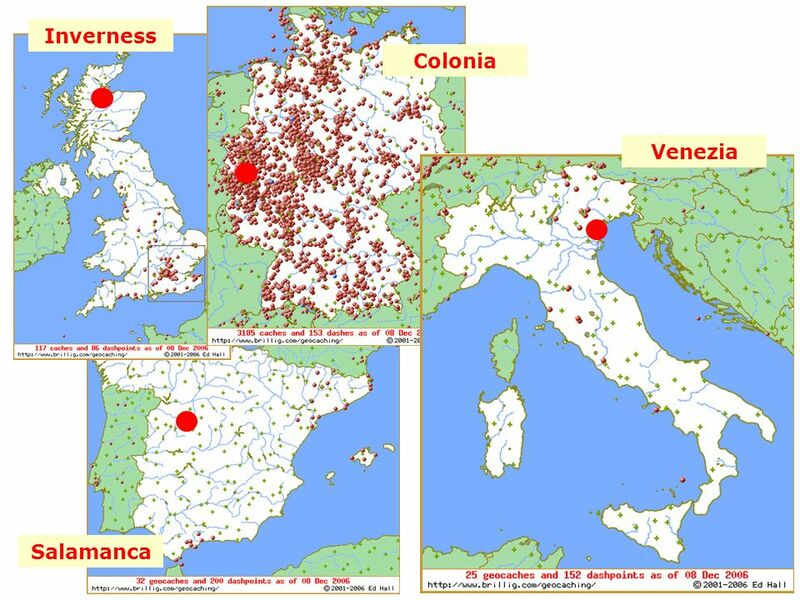 No caches placed on archaeological or historical sites. No caches close to active railroad tracks. 150 feet minimum. No caches on military installations. No caches near or under highway bridges, dams, government buildings, or airports. 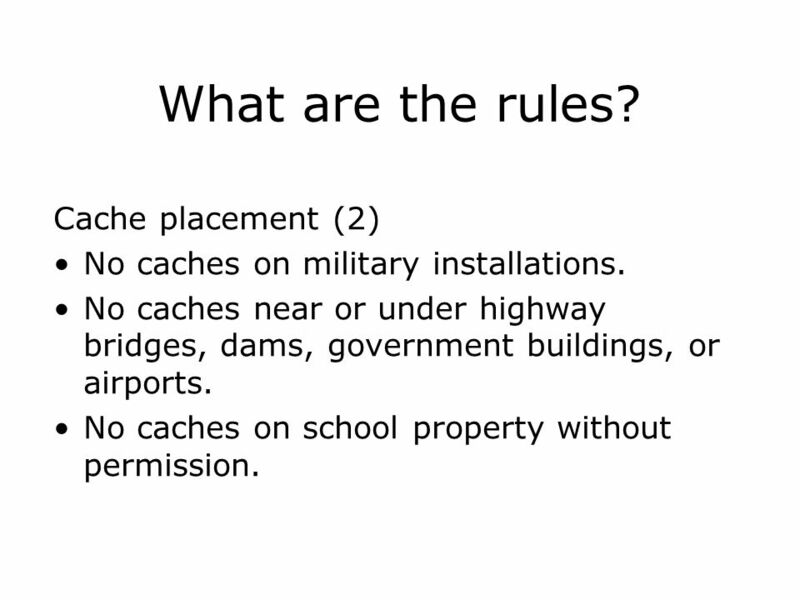 No caches on school property without permission. 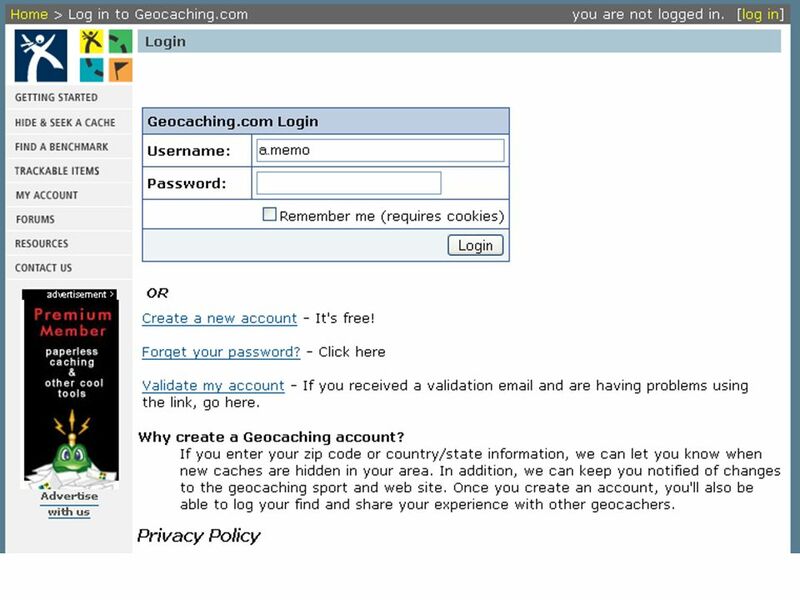 What is this 'geocaching' thing anyway? 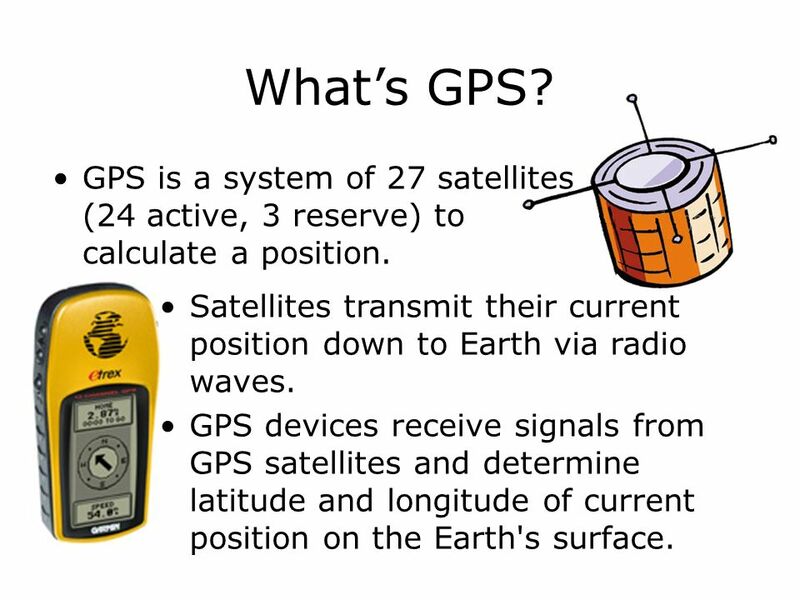 What's a GPS receiver? What's the catch? What does one find in a typical cache? How much does geocaching cost? 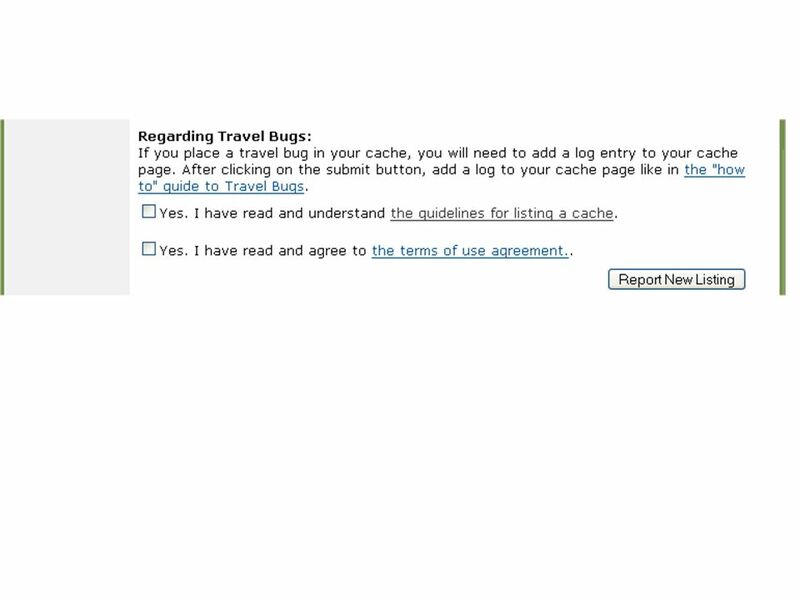 What should I NOT put in a cache? Who goes geocaching? What precautions should I take? Who invented geocaching? 35 What is Geocaching? In short, it is a high tech treasure hunt. 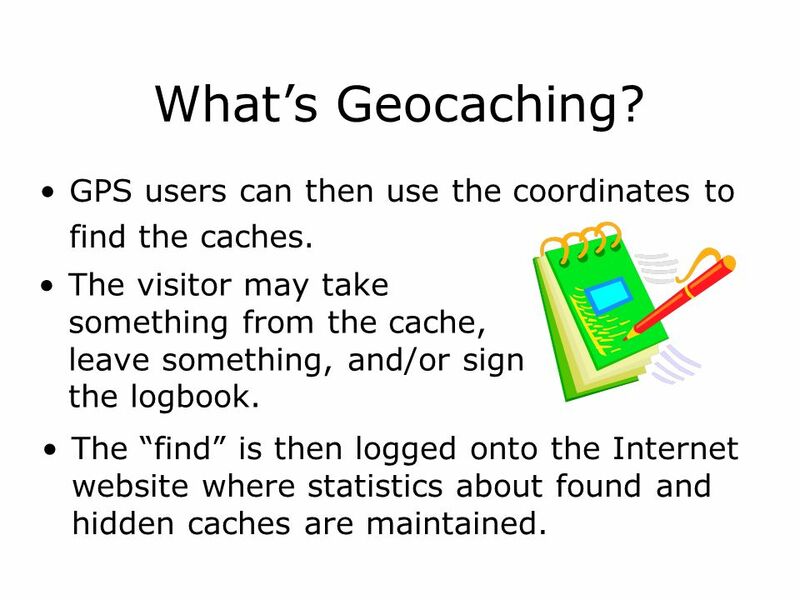 To find a “cache” use a handheld GPS receiver and coordinates found on geocaching websites. 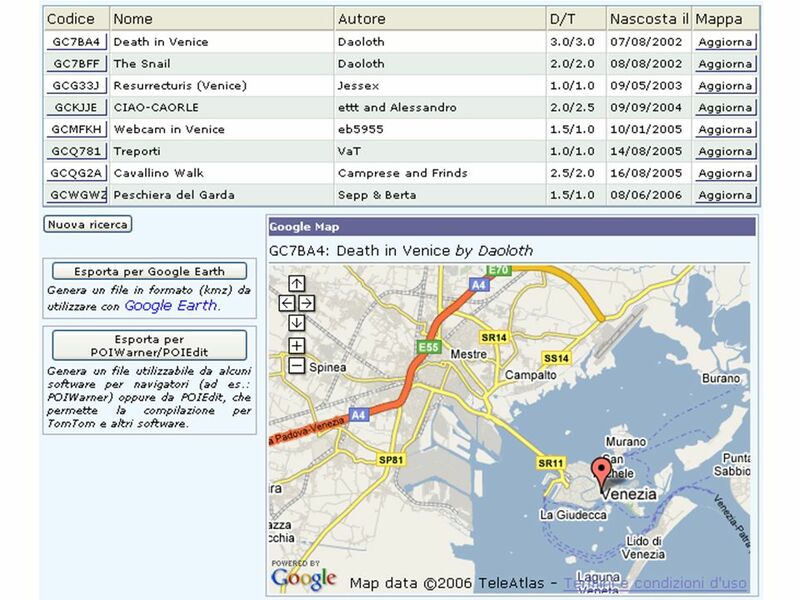 Enter the coordinates into the receiver and let the receiver guide you to the cache. 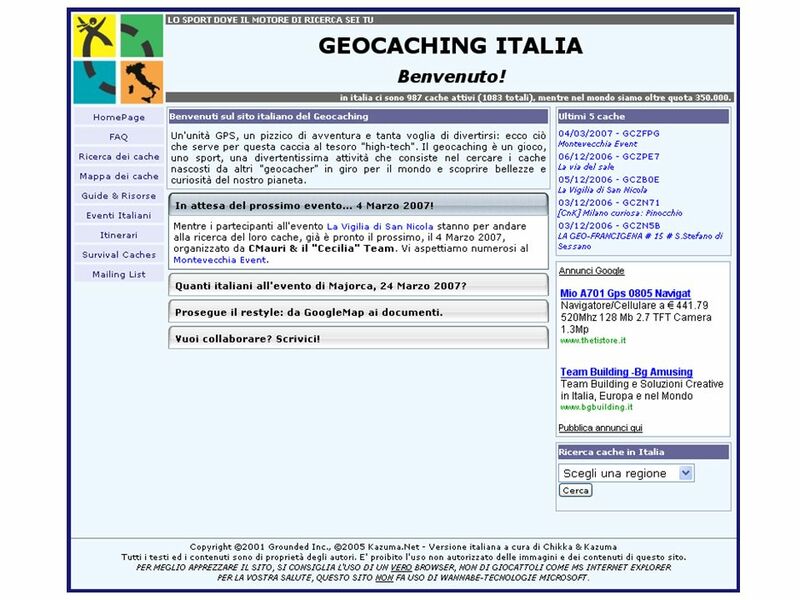 There are many variations in geocaching: Offset caches: The coordinates are usually a historical monument or plaque. 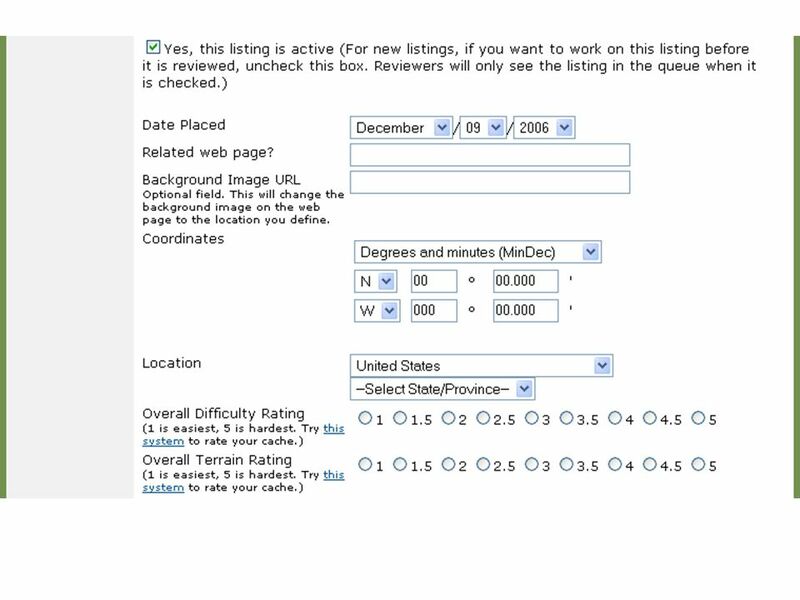 From there you would look for offset numbers stamped or written nearby the location and/or continue based on instructions found. 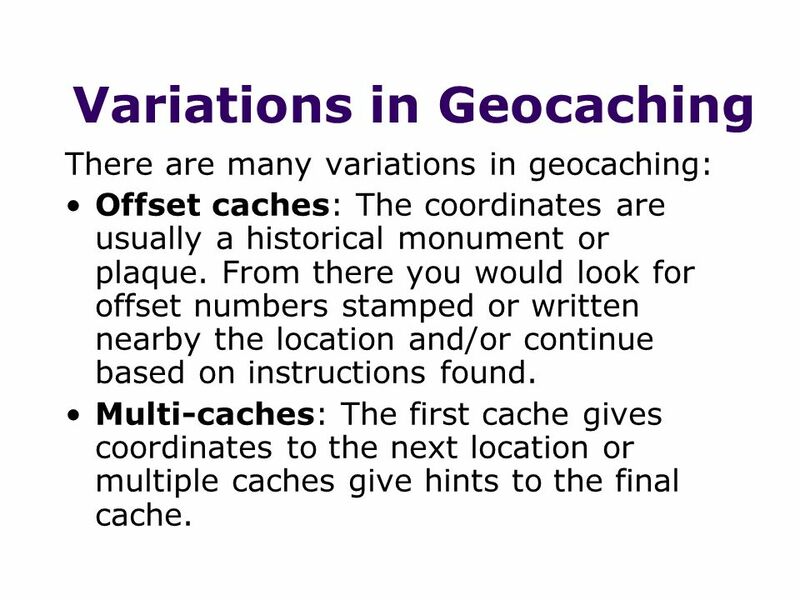 Multi-caches: The first cache gives coordinates to the next location or multiple caches give hints to the final cache. 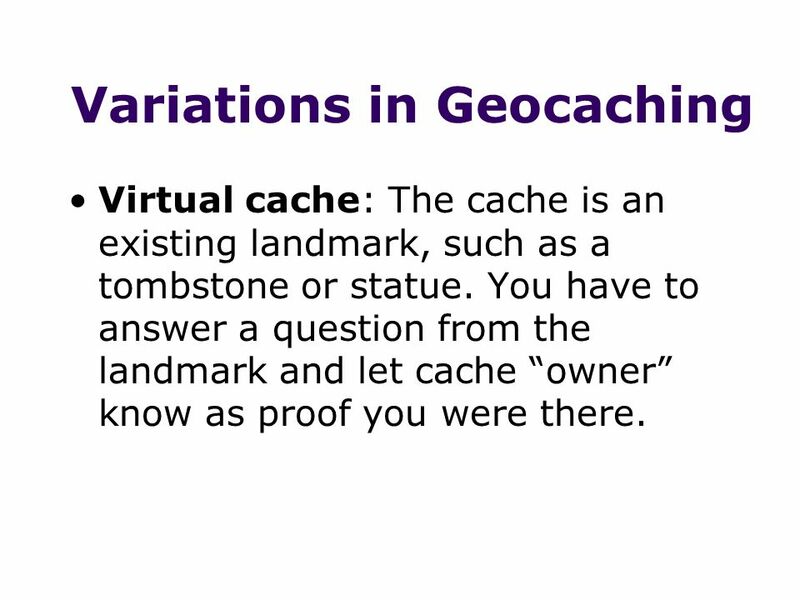 Virtual cache: The cache is an existing landmark, such as a tombstone or statue. You have to answer a question from the landmark and let cache “owner” know as proof you were there. 38 What is a cache? 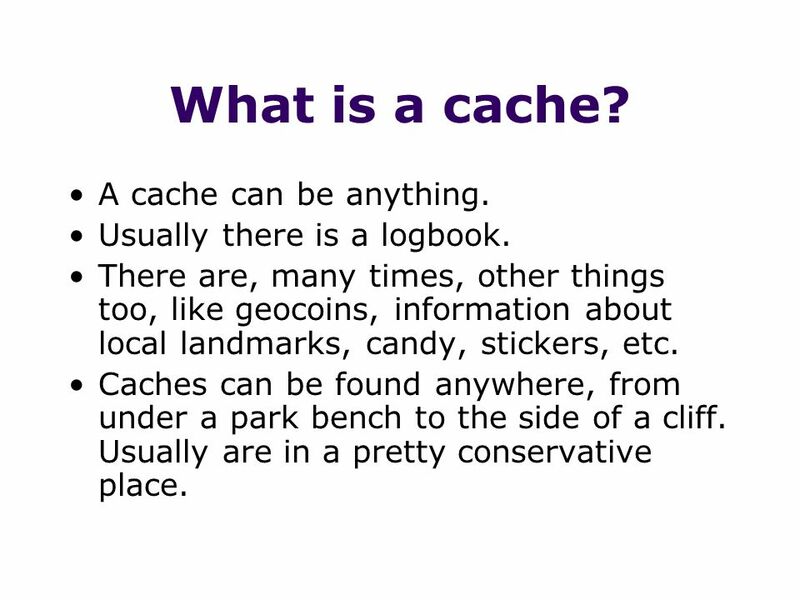 A cache can be anything. Usually there is a logbook. There are, many times, other things too, like geocoins, information about local landmarks, candy, stickers, etc. 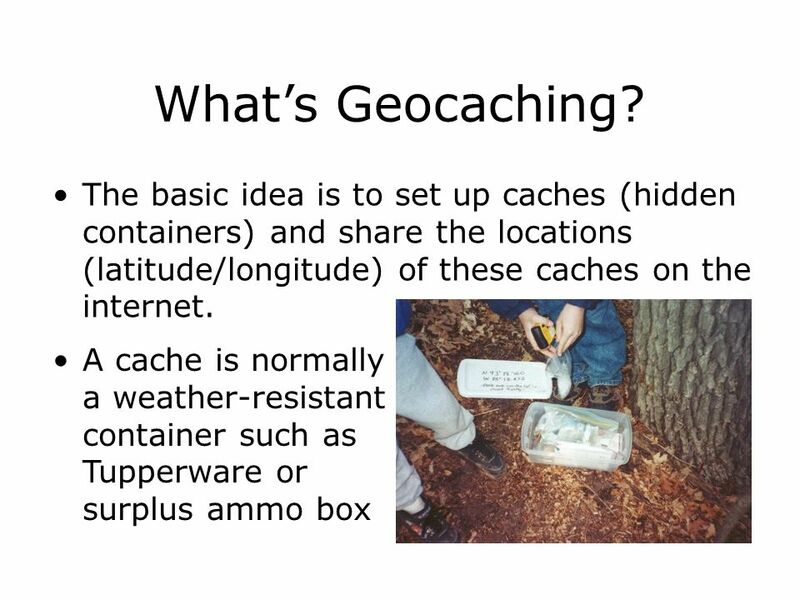 Caches can be found anywhere, from under a park bench to the side of a cliff. Usually are in a pretty conservative place. 39 Cost? 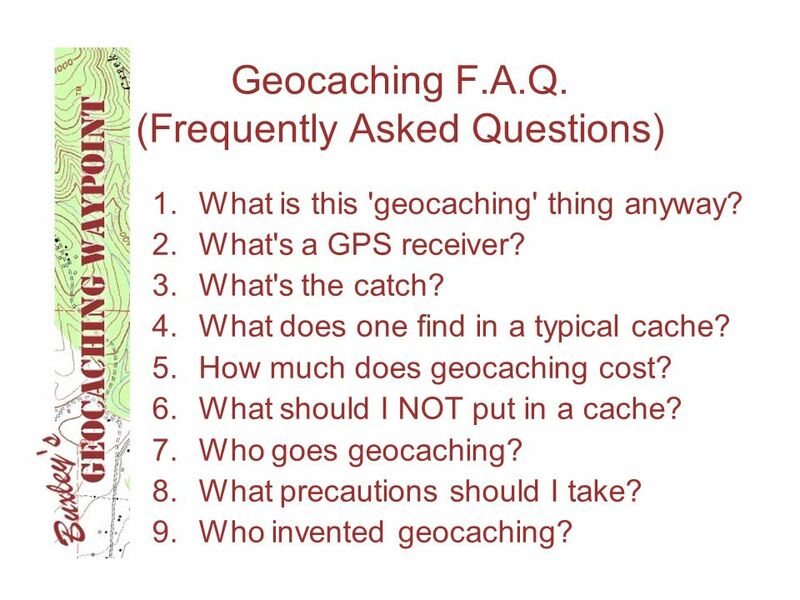 The only thing you need to go geocaching is a GPS receiver and coordinates to the location. 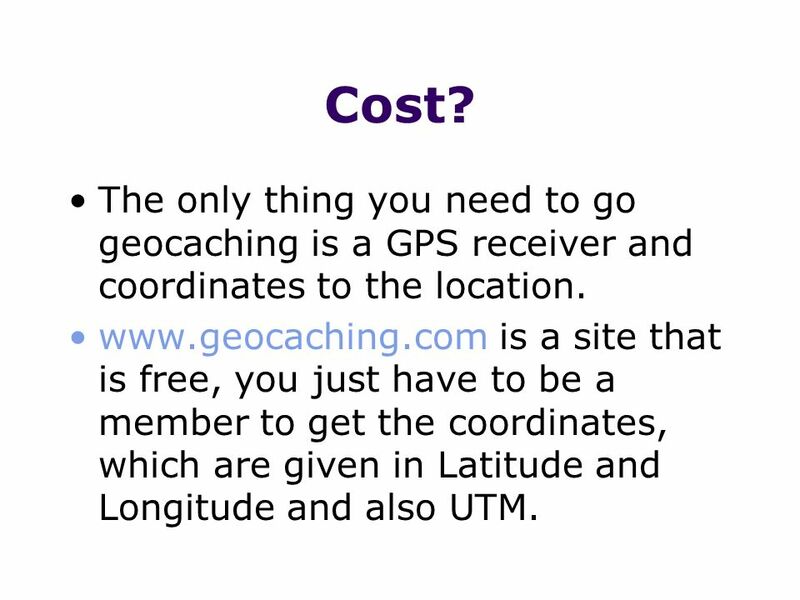 is a site that is free, you just have to be a member to get the coordinates, which are given in Latitude and Longitude and also UTM. 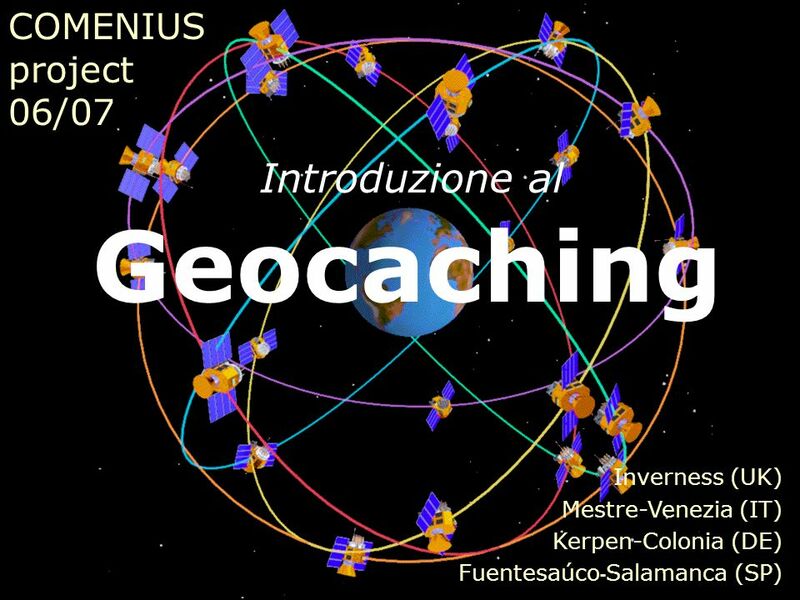 Scaricare ppt "Geocaching Introduzione al COMENIUS project 06/07 Inverness (UK)"
Università degli studi di Roma Tor Vergata Facoltà di Ingegneria - Corso di Laurea in Ingegneria delle Telecomunicazioni Reti Mobili e Multimediali Localizzazione. Come fanno i ricercatori a vedere le particelle? Enzo Anselmo Ferrari By Giovanni Amicucci. Di Enzo Questo è Enzo Anselmo Ferrari. Enzo compleanno è diciotto febbraio Enzo muore è quattordici agosto.